Weather: Cloudy and cool to sunny and in the 60s(!). Two brief showers. Windy. 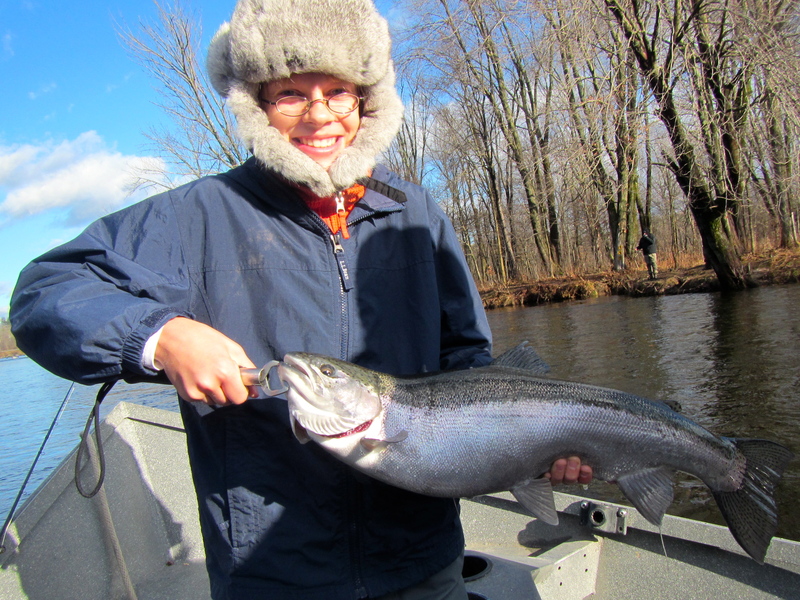 Cam’s first steelhead landed on a fly rod. He’s a natural. Downriver, I figured I’d need a hi-vis pattern to get the fish’s attention. I hemmed and hawed, considered an Egg-Sucking Leech or other streamer, then tried an Estaz Egg/San Juan Worm pattern. No. Tied on the Bead Head Lifter, got the answer I was looking for, and kept it on for the rest of the afternoon. Ugh. Miles of dirty water. Scores of beleaguered anglers lining the shores. At least they could have gotten into their trucks and driven upriver. But we were bound by the confines of the boat, gravity, and what nature had thrown at us. As the saying goes, you don’t know if you don’t go. Six steelhead landed is a damn good afternoon, any day. In swollen mucky runoff, it’s lottery lucky. Wow. We’ll take it. Guide rating: Highest marks. 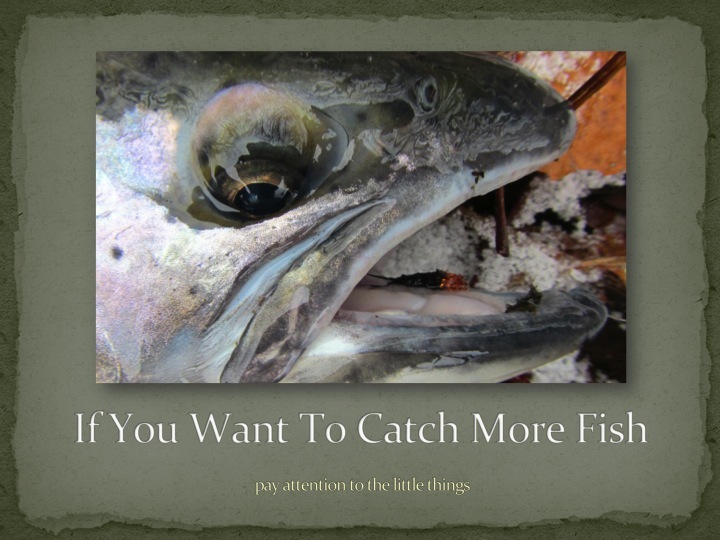 Jim Kirtland has what you’d call deep domain knowledge of the Salmon. His netting skills are exceptional. Very recommended. 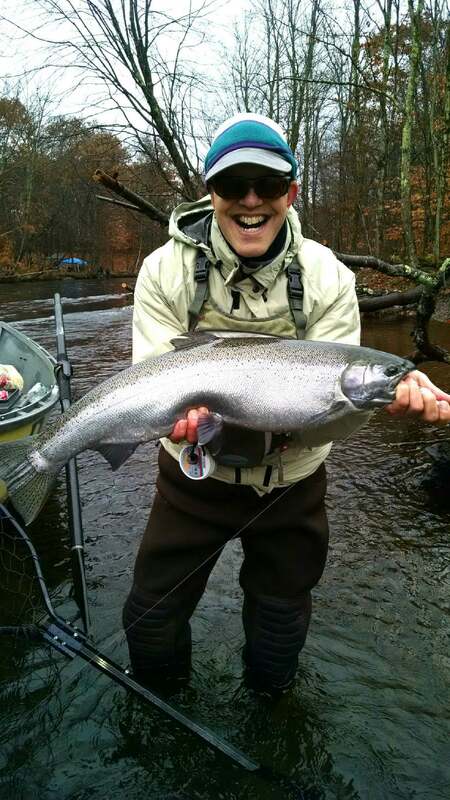 Number of steelhead I landed in 2012: 1 (sometimes the bear eats you). Number of steelhead I’ve landed in the last 13 months: 41 (sometimes you eat the bear). 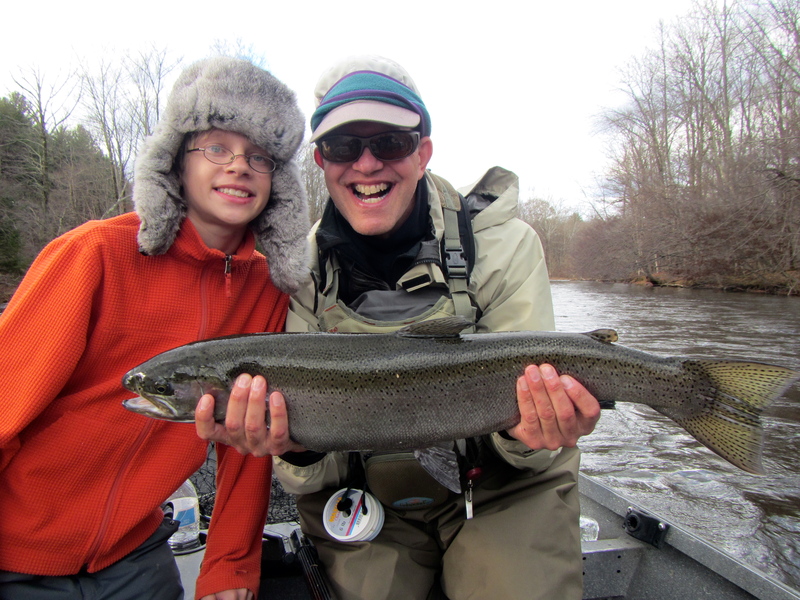 On a scale of 1-10, energy I felt from being out on the river on a spring-like November day with my son catching steelhead: C’mon. Hello, fellow fly fishing reader. Get your eyeballs ready for a couple articles from yours truly. 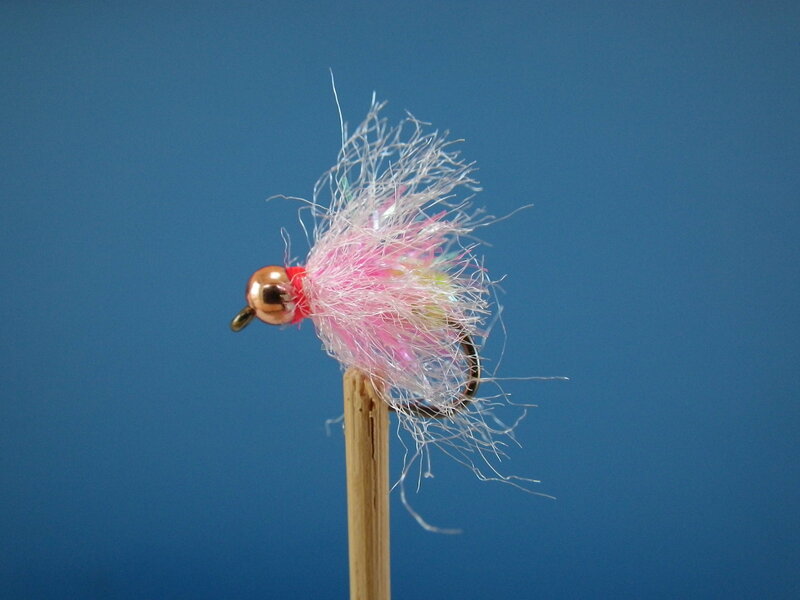 Soft-Hackles for Winter Steelhead will be in the next (Jan/Feb) issue of American Angler, which should be out in early December. 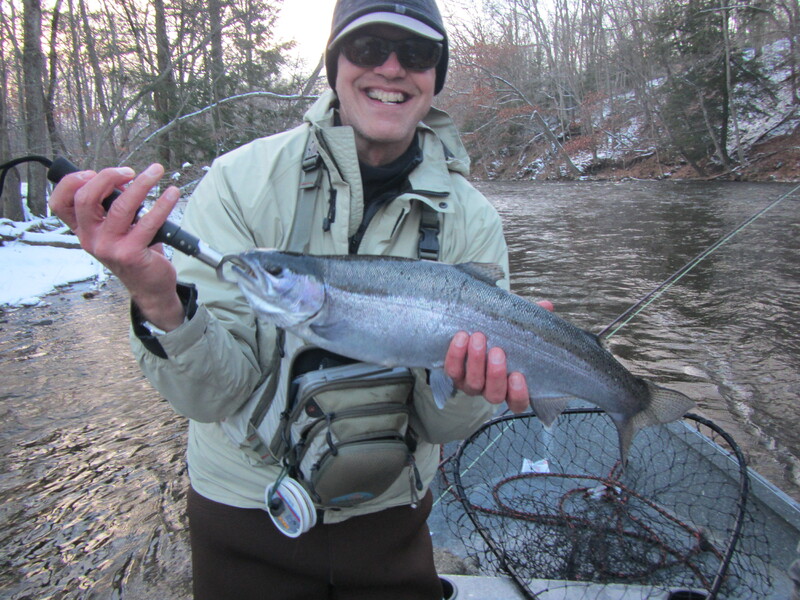 It takes a look at some of my favorite patterns for Great Lakes winter steelhead, and of course includes a few fishing stories into the bargain. 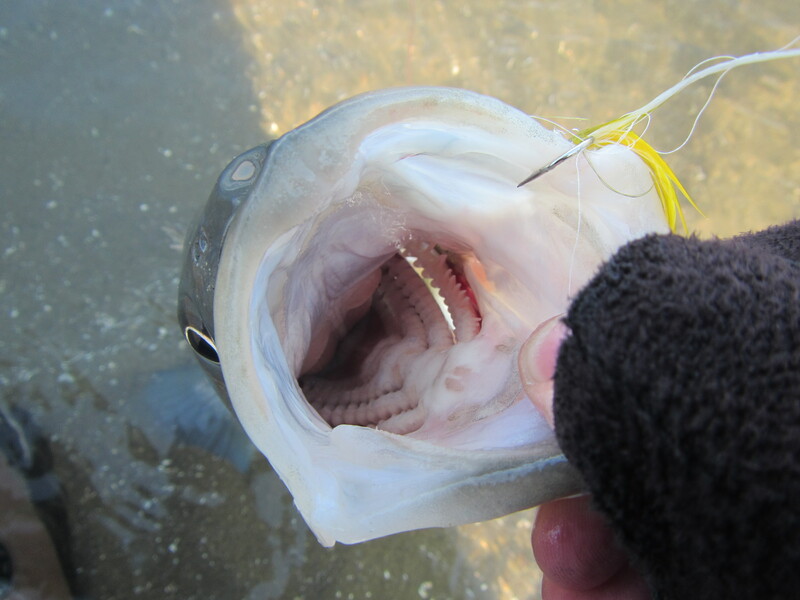 Winter on the Farmington will be out early next year in the Mid Atlantic Fly Fishing Guide. One guess as to the subject matter. Gadzooks, I have yet to write this. And my deadline approaches rapidly from the east. 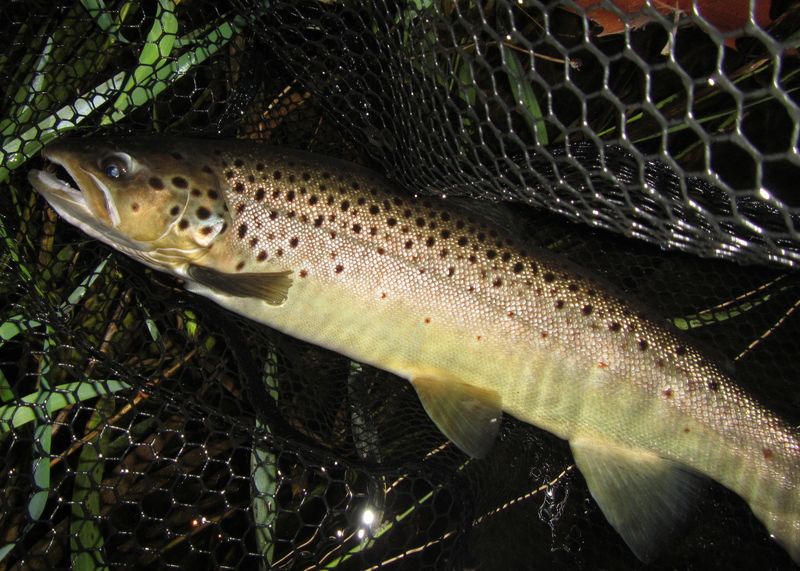 On the noncommercial front, I still owe you my Block Island Diary 2014 and a report from my recent steelhead trip. I ask for your patience while I restock my pens. As always, thanks for your readership. And thanks to those of you who follow currentseams. A quick zip in, zip out striper mission yesterday to see if anyone was around. They were, for a brief window. I missed the first 45 minutes (according to the other angler I spoke to — I didn’t get your name, but thanks for sharing the water). But for a half hour, it was nearly a Bass-O-Matic. While the fishing wasn’t very technical, there was a key to success: getting the fly to the bottom where the bass were hanging out. 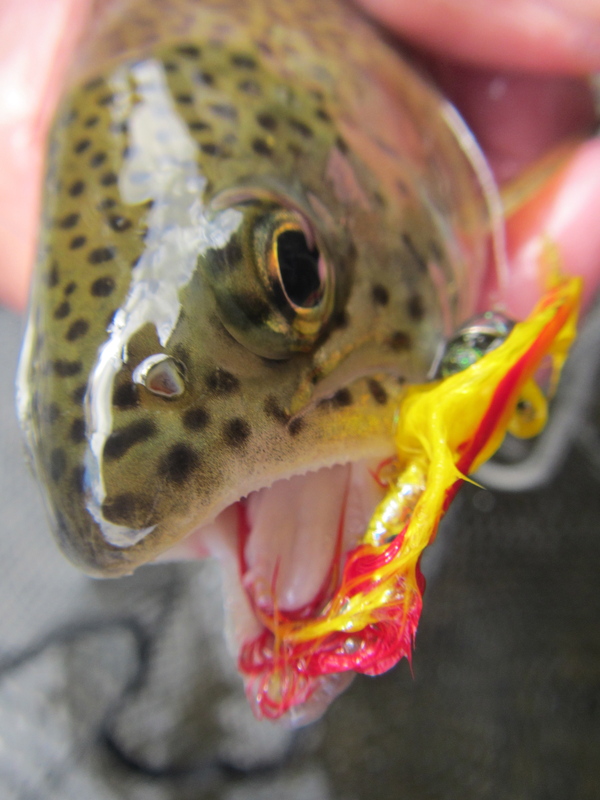 I was fishing a floating line with a four-foot section of T-11 sink tip and a weightless soft-hackle about three-to-four inches long. Not deep enough. Once I added a 3/0 shot to the leader and threw some mends, it was bottom — and striper — city. And then, like that, they were gone. I tried a few other rips (not easy to find with a 10-20mph SW wind disturbing the surface) but decided that when the local who fishes this spot all the time left, he knew something I didn’t. And off I went. The tide comes in. 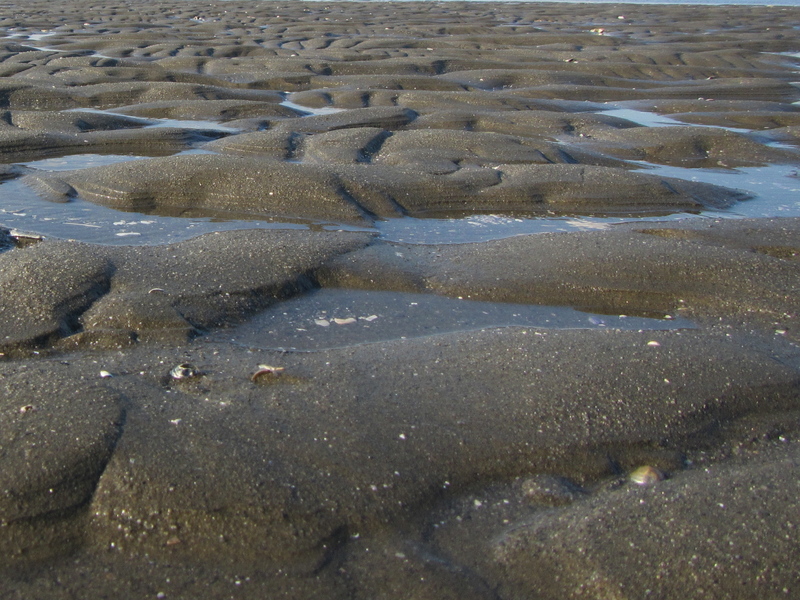 The tide goes out. Leaving lovely sculptures in its wake.